In a controversial climate of selfies, body image and political correctness, say hello to the modeling agency that is slowly changing the face of fashion: The Diigitals. Meet Shudu: an undeniably drop dead gorgeous supermodel, with a compelling look that has caught the attention of many global high fashion brands, and is slowly but surely championing diversity in the world of fashion. Born in the home studio of photographer and visual artist, Cameron-James Wilson, Shudu is in fact an expertly created digital being. She was brought to this world by Cameron himself, when he first decided to embark on a new creative project. Coming from a background in fashion photography, Cameron was looking to change his career path, and ended up forming the world’s first all digital modeling agency, The Diigitals. Intrigued by the unbelievably realistic models showcased on their Wix website, we decided to catch up with Cameron-James Wilson to discover more. Ten years into a successful career in fashion photography, Cameron felt that he wasn’t being fulfilled creatively. “I enjoy so much about fashion,” he explains. “I had so many interests that weren’t captured in photography.” Despite the tough decision and the guilt feelings, Cameron eventually decided to try out something new. He began experimenting with 3D and soon discovered Marvelous Designer, a tool that enables you to design 3D clothes and fabrics. After designing some looks, he needed a model to wear the clothes. “I found Daz 3D and started posting my work online. Fairly quickly, I got 10,000 followers and some really good replies. I felt like I was onto something,” Cameron tells us. And indeed he was onto something. That was the point at which Cameron began developing the character that would become Shudu – a stunning, 151K follower-strong supermodel and influencer. “I had the idea of creating a dark-skinned woman wearing a gold necklace, inspired by the Ndebele tribe in South Africa,” he recalls. “I envisioned a really opulent image, with an elegant and regal look. Another inspiration was a Barbie doll that I had. When I had finished, I posted the image to my personal Facebook, then a friend posted it on their Instagram account and it went viral. Everyone thought she was a real supermodel, but I had only planned on creating an image, not a character. I was completely taken by surprise. Some friends advised that I should keep people guessing, so I created an Instagram account for her and tried to make her as convincing as possible. As an artist, it was so interesting to hear people discussing my work. 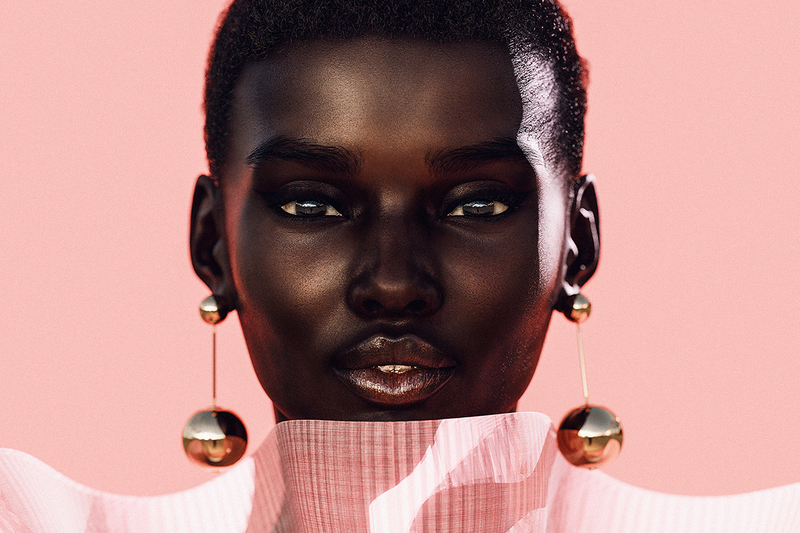 But when it got to a point that there wasn’t really a discussion, but rather just people saying how beautiful she was, it stopped being ambiguous and I decided there was no reason to keep it anonymous.” Knowing what we know now, that Shudu is a 3D digital model, only adds more layers of curiosity and intrigue. Shudu in a Fenty Beauty inspired image. After having created a Fenty Beauty inspired image that ended up being reposted by Fenty and going viral, Cameron found himself faced with criticism, raising questions of race and authenticity. “I was so inexperienced and naive. The only intent was to create beautiful imagery. I knew it could get twisted, especially in this controversial climate. Gradually, I learned how to explain myself better and I made sure to change my hashtags so that it would be very clear that Shudu was not real. I wanted to raise awareness of the technology and shed light on the fact that what you see on social media might not be real at all. I think that’s quite profound,” says Cameron. Following the success with Balmain, Cameron decided to take it one step further and launch The Diigitals – a digital agency for models and collaborating brands. Him and Tom Lockyer, a friend and the graphic designer behind design studio Pixel Flamingo, had been developing an idea for a digital agency for a while. “One day I saw lots of posts on the subject,” says Cameron. “And I felt like we had to get it out before someone else did, so we ended up staying awake for 24 hours to create a website on Wix. As a control freak, I love being able to easily change anything on the site. We went for an extremely simple layout that puts the emphasis on the press. We wanted to inspire and enable people to reach out. Since launching The Diigitals, it’s been great – I get to sit down and think of what new and exciting things to do next.” Applying a very artistic approach to their projects, Cameron sees The Diigitals as a creative agency under the guise of a modeling agency, that also collaborates with tech companies on innovative projects. When first creating Shudu, Cameron explains that he made her body to be unrealistic. Simply creating his own muse, he had no idea on the impact she would have. Once he’d understood the power of his creations, he started developing an additional model – Brenn. “She’s still idealized, but she represents a lot of the things that I might feel self conscious about,” explains Cameron. “She has stretch marks on her torso, but she makes them look normal and natural and beautiful. She makes me feel better about myself.” With 3D models, the benefit is that the audience is aware of the fact that they’re not real, so in a way, there’s less of a danger that people will compare themselves to them, as opposed to real models that look perfect because they’ve been so retouched.